Q: I've finally (yeah) figured out how to add a digital background to my picture enhancing my portrait subject - NOW I need to figure out how to PRINT it without the pixels separating. I have adjusted the image size after the picture was edited... but I'm thinking I need to do this before...? ANY SUGGESTIONS? A: There are a lot of variables that go into printing a digital file. You need to consider the physical dimensions of the image. Also the resolution of the image and the resolution of the printer. The resolution of the image is expressed as Pixels per inch. Most home inkjet printers will print a good quality photo if the image is at least 225 pixels per inch. 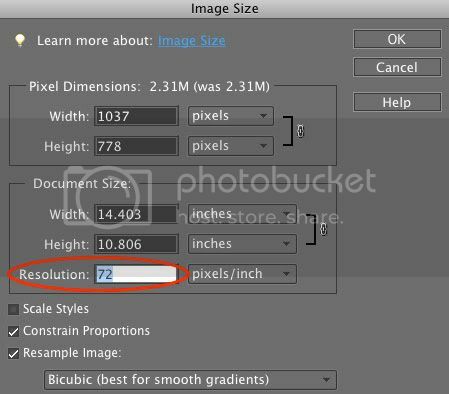 You can see what your photo's resolution is by looking at the Resolution field (circled in red) in the Image Size dialog box in Photoshop Elements. 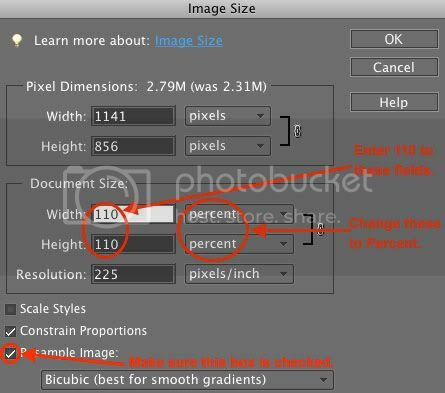 Go up to the Image menu and choose Resize>Image Size…. You can get by with a lot less resolution (pixels/inch) if you're just going to view a photograph on a computer or other digital device. It's only when you make a physical print of the image that you need more resolution to get a quality print. If you don't have enough resolution the print will look "pixelated" (what you aptly described as the pixels separating). You need to realize that increasing the resolution will decrease the physical dimensions of the photo. Notice in the Image Size box above the Resolution of the image is 72 pixels/inch (ppi). And the Width and Height is 14.403 x 10.806. 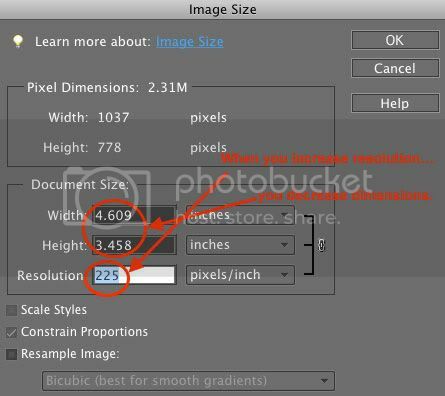 To change the Resolution to 225 ppi for printing you want to Uncheck the box at the bottom that says Resample Image. Now just change the Resolution field to 225. Notice the Width and Height size decreased. So when you increase the Resolution you decrease the physical Dimensions. Go to Image>Resize>Image Size… to open the Image Size dialog box. This time make sure the Resample Image box is checked. Change the measurement units to the right of the Width and Height fields from Inches to Percent. Type 110 into the Width and Height fields. Repeat the above steps until your image is near the size you want to print it at. I hope this information gives you what you need for a quality print.